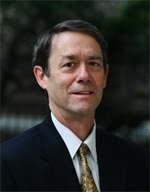 Frederick C. Moss, Associate Professor in the Dedman School of Law, received his A.B. degree from Georgetown University, his J.D. from Villanova University School of Law and his LL.M. from Harvard Law School. Before joining the faculty at the Dedman School of Law in 1978, he was an assistant U.S. attorney. At the SMU law school, Professor Moss has taught professional ethics, criminal law, evidence and trial advocacy, as well as constitutional and Texas criminal procedure. He also has served the law school as director of the Lawyering Program and associate dean for Lawyering Skills and Clinical Education. Outside the law school, he has served as chair of the Dallas Bar Association's Ethics Committee and as an examiner for the Texas Board of Legal Specialization for 15 years. In the latter capacity, he wrote the evidence portion of the personal injury and civil trial law examinations. Professor Moss has lectured and written in the areas of evidence and professional ethics. In addition, he has served the National Institute for Trial Advocacy as director of its Southern Regional Basic Trial Skills Program and currently serves as director of the Institute's Southern Deposition Program. He retires as Professor Emeritus of Law.